41 – Ever wondered what Voldermort’s attachment style is? Does Bellatrix Le Strange meet criteria for Borderline Personality Disorder? What about Snape? Is his behaviour schizoid, obsessive or best explained by complex grief? 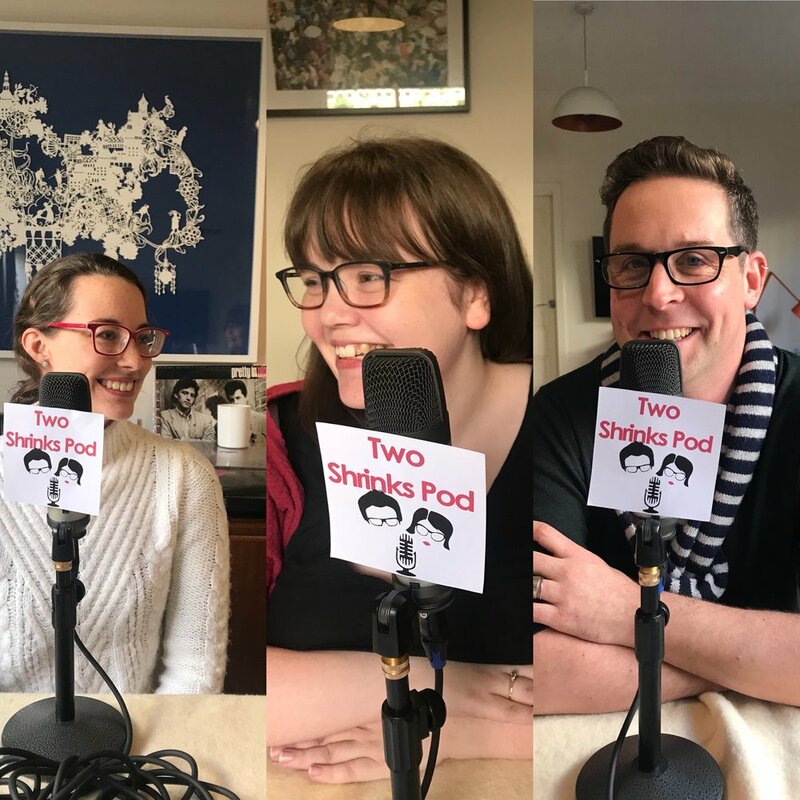 If you are a fan of Harry Potter then this is the Two Shrinks Pod episode for you. In this episode Amy and Hunter go through each of the ten personality disorders discussed in the personality disorder series last year and discuss which characters from J.K. Rowling’s Harry Potter books could have personality disorders. They also discuss possible differential diagnoses and ponder the use of words starting with P in the DSM-5 diagnostic categories. For a bit of fun Hunter gives Amy the Two Shrinks equivalent of her O.W.L.s, quizzing her on her Harry Potter knowledge at the end of each personality cluster. 40 - Are you psychologising me right now? Do you think about me when I’m not here? Can I be the only one that sees you next time? Do you think I’m crazy? Why would I come and see if you if you’ve never had this problem? My kid has the problem so why are you telling me I need to change? How do you cope with everything I tell you? Should I leave my partner/job? Where do you live and can I touch your hair? Yep - these are some of the questions psychologists get every day - so we decided to run through these and talk about how we respond to them and why. This is the ep for anyone who is super curious about psychologists and why we act the way we do - it should also be good for other psychologists to know they aren’t crazy and their experiences are normal (also see question four). For this episode we got Liz Daff (from the forensic episode) to join us in this discussion to give us an additional perspective on these questions. We finish off with “Pods We Came Across” - pods we’ve been listening to this year. 39 - Ever wondered how athletes improve their mental game and stop cracking under pressure? Or would you like to know how you could improve your own performance in sport (or anything else)? Then this is the episode for you. Hunter chats to Michael Inglis, sports psychologist and co-founder of The Mind Room https://themindroom.com.au/ about a mental conditioning program he runs for athletes. Michael has worked with professional athletes from many different sports including AFL, rugby, soccer and cycling and has a wealth of experience. The episode wraps with a food orientated Things We Came Across discussion of being “hangry” and orthorexia. For the final interview of psychology week, Amy talks to Dr Timothy Schofield, research fellow at Melbourne University. They chat about Tim’s research into the stigma associated with welfare benefits, what makes a group vulnerable to stigma and the challenges of a research career. We wrap up with a Things We Came Across that soothes Amy’s doubts and riles up Tim with references to embodied cognition. In our next interview for psychology week, Amy chats with Laura, a PhD candidate who’s researching the parts of our brains that are active in social anxiety. We talk about what happens when we think about ourselves and others at the same time, how they might be skewed in social anxiety and what it’s like being a PhD candidate. 36 - for the second psychology week 2018 interview Hunter talks to Dr Kathleen Leach about chronic pain and the role psychologists play in the treatment and management of chronic pain. Kathleen has extensive experience working with patients who have chronic pain. Our usual experience of pain is that pain means damage but this is not the case in chronic pain which is different to acute pain. Some of the topics covered include the risk factors for developing chronic pain as well as why the best practice treatment of chronic pain is done with team of a physiotherapist, occupational therapist and psychologist, in additional to medical staff. Kathleen talks about some of the psychological approaches to help patients improve quality of life and management of their pain, such as countering unhelpful boom/bust cycles. 35 - Want to know how to get better sleep? Then have a listen to this episode which is our first in the series of interviews for psychology week 2018. Hunter talks to Dr Lyndel Shand on how to get better sleep, they talk the ins and outs of sleep hygiene, why it is important to understand sleep cycles and stages of sleep if you are to improve sleep. As sleep problems can mean different things to different people they then talk through several cases examples exploring how psychologists (and you can) resolve sleeping issues. Topics include struggling to get to sleep, struggling to get back to sleep after waking, not going to bed, and hyper-somnia. Hunter and Lyndel finish up with segment Things We Came Across, discussing the important topics of whether knuckle cracking does give arthritis, and the correlates of binge watching television. Psychology Week 2018 and 2SP is having a podathon! We have conducted four interviews and we will release one each day this week. Psychological treatment of chronic pain - with Dr Kathleen Leach - Hunter interviews Kathleen who has extensive experience working with people with chronic pain. They discuss the role of psychology in the treatment of chronic pain and how psychologists work in to improve the lives of chronic pain patients. Neuroscience of Social Anxiety - with Laura Finlayson-Short - Amy has a great chat with Laura, who is a psychology PhD candidate about what our brains do when we are socially anxious, and discuss what it is like being a PhD candidate. Understanding Stigma - with Dr Timothy Schofield - Amy talks to Tim who is a research fellow about his work on understanding stigma towards the self and others (eg. towards those on welfare payments), and have a candid discussion about what it is like working as an academic. For each we also got our guests to join in on the Things We Came Across section - with interesting results. Know someone who likes to have things neat and tidy, sticks rigidly to the rules and appears tightly wound? This week we’re talking about the characteristics of Obsessive Compulsive Personality Disorder. In the last of our personality disorders series, we cover diagnosis, theory and treatment of this PD. We attempt to avoid self-diagnosis (Hunter), outwardly reject prior misdiagnosis (Amy) and barely refrain from diagnosing the entire psychology profession with OCPD. Wrapping up the show, Hunter talks about medical journal articles from the 1800s and Amy ponders if she’s got what it takes to survive an apocalypse. 33 - Dependent Personality Disorder - "Please look after me"
Pod 33 - The penultimate episode of our personality disorder series takes a look at Dependent Personality Disorder - when someone has an excessive need to be taken care of, is submissive, clingy and fears separation. Whilst it is a rare PD (<1%) all of us have dependent elements and Amy and Hunter also compare it to some of the other personality disorders discussed in the previous pods. There is, as usual, good discussion about different theories to explain this disorder (hear Hunter get frustrated about psycho-dynamic theories) and finishes up with talking about how to do therapy to address the problems of this disorder. For TWCA Hunter spends a moment talking about Dr Christine Blasey Ford and her research, then pivots to discussing what your resume photo really tells others, whilst Amy succumbs to more research about the tv show Survivor (hey we have a brand and we are sticking to it). This week, Two Shrinks is leaving behind cluster B personality disorders and launching into cluster C, taking a long look at Avoidant Personality Disorder. We’ll chat about the people who seem shy, quiet and invisible, hanging out on the the fringes of social interactions. Continuing our PD series, we’ll take you through diagnosis, theories and treatment. As always, we wrap up with things we came across - Hunter discloses he has been binging on a Survivor podcast (Oz survivor). and ponders the effects of watching reality tv on aggression? Then they discloses Are Amy’s phantom vibrations normal? Join us next time for Dependent PD! 31 - Forensic psychology with Liz Daff : working in prisons, working with anti-social personality disorder and psychopathy. 31 - Finishing up our mini-series on Anti-Social Personality Disorder and psychopaths we thought we’d talk to our colleague Liz Daff about working as a forensic psychologist. That is, a psychologist who works in prisons or forensic settings with people convicted of crimes or about to go to trial. This interview was so interesting and gripping. It is for anyone fascinated by crime shows (Midsomers Murders anyone?) or wondered what it’d be like to work with someone convicted of a serious crime. Liz is completing her clinical and forensic training through Swinburne University and gives a great description of some of the challenges working in this area. We of course finish of with ‘Things we came across’ which Liz joins us for, with a discussion on the lack of evidence base for parachutes, Amy talks about anti social personality disorder and Survivor (the tv show), Hunter meanwhile talks about the psychological processes behind why his honey, lemon, cloves and ginger drink helps with head colds (ie. the placebo effect). This episode we decided to continue on from pod 29 and chat more about psychopathy. Amy takes us through a discussion of how psychopathy does and does not manifest itself in children and adolescent. Spoiler – it does and doesn’t. Hunter then talks (at length) about ‘successful’ or non-incarcerated psychopaths, think nasty politicians, corporate CEO, that kind of thing. At about 47 minutes we jump to a discussion about treatment of psychopaths and anti-social personality disorder which is really interesting. For TWCA Hunter ponders the number of Subway stores by country and talks about white-coat hypertension, whilst Amy finds comfort in knowing chimps fake laugh to improve social standing. The Handbook of Psychopathy – Christopher J. Patrick (Ed). This week on Two Shrinks Pod we're looking at the darker side of human nature. Hunter & Amy chat about the diagnosis of Anti-Social Personality Disorder, psychopaths and sociopaths. Lump Hannibal Lector and The Grinch (pre-heart growth) into the same camp and get nerdy over theory. We lighten things up at the end with a chat about the (perfectly normal) brain reasons Amy sees faces in things and blame Hunter's snacking on social influence. Join us next time for a chat about ASPD treatment! In this week's pod we chat with Chris Hayes, clinical psychologist and advanced schema therapist. Chris talks us through common schemas and modes in Narcissistic Personality Disorder, therapeutic approaches and the challenges of this work. He also answers our varied questions about schema therapy for personality issues. As always, we finish up with things we came across - Hunter chats about emotional expressions and the World Cup and Amy confirms that clowns are creepy. Was anyone questioning that? This week we take a look at Narcissistic Personality Disorder (NPD) and answer our own burning questions: What is it like interacting with someone with NPD? How can you tell the difference between traits and diagnosable NPD? What are the theories about how it develops? And of course, which politicians meet criteria and what are the ethics of labelling them as such? As always, we wrap up with Things We Came Across – Amy chats about why healthy food tastes better if you've prepared it yourself and Hunter chuckles about scanning salmon. Join us next time for an interview with a psychologist using schema therapy with clients with NPD! We're back after a short break with a discussion about DBT for BPD. Hunter takes us through the key components of Dialectical Behavior Therapy which is used to treat Borderline Personality Disorder and we chat about the processes and challenges of this work. The pod goes into the weeds of this treatment so to speak - it is a long conversation but stick with it as it is some really interesting parts. It should be of interest to anyone who is interested in learning about therapy, should be good for psychologists who don't know much about DBT and for anyone with loved ones who have BPD. The episode finishes up with a chat about music through the seasons and Hunter using research to rationalise his holiday butter consumption. Join us next time as we continue to talk about cluster B personality disorders. This ep we are talking about Borderline Personality Disorder - one of the most interesting, challenging and controversial personality disorders. We chat about the symptoms, aetiology, controversies and issues in therapy when working with someone who has BPD. it was recorded at the same time as the last ep (Histrionic PD) and so it's essentially part two of our discussion about Histrionic and Borderline PDs so in the the reverse of last week Amy will be doing most of the talking. Hunter wraps this week up discussing some research on knitting - what's driving us to pick up the yarn? Join us next week for a discussion about BPD treatment. This week we got a little carried away talking about cluster B personality disorders so instead of discussing two PDs we've split the episode in two and just talk about one. First up, Hunter talks us through Histrionic PD: what are the symptoms, how do clients with this disorder present and what do we know about the theoretical background? Amy wraps it up with a things we came across about aesthetic goosebumps, inspired by the great pod, Every Little Thing. Next week Amy will take us through Borderline Personality Disorder and Hunter will do TWCA. More specific reading on HPD : Personality Disorders in Modern Life. (2000). Millon & Davis. Wiley. If you google the title of this book there seems to be downloadable pdfs of it available at no cost. Every little thing - Why does music give us the chills?